Nadi Legends Club (Fiji Soccer): TRIBUTE: A tribute to Mr. Jai Chandra, Nadi fan / University of Fiji Lecturer (Accounting), by Kieran James / Ruth Irwin, 5/3/2016. TRIBUTE: A tribute to Mr. Jai Chandra, Nadi fan / University of Fiji Lecturer (Accounting), by Kieran James / Ruth Irwin, 5/3/2016. 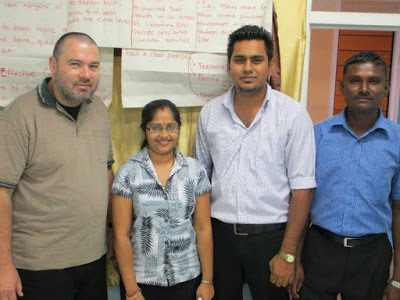 Mr Jai Chandra (first on right) with Professor Kieran James (first on left) and Jai's best friend Mr. Riaz Mohammed Azam (third from left) @ University of Fiji Saweni campus. 2 "A bus load of us went to Jai’s funeral yesterday. I thought you might like to know how it went. It was very big – he was a very popular man and very well respected in his community. As you probably know, he was the last person in his immediate family. There were a great many cousins there, and they were deeply affected at his death. One of the women was quite hysterical. It was really sad. I think ... she felt bereft of him, and worried about the future. He had built a really good concrete house. It was well constructed, with lovely tiles on the floor. Not quite finished but definitely nearly there. He built the whole thing himself. The funeral was in the front porch which had a big corrugated iron awning. Its quite a rural settlement up the Votualevu road. The ceremony was really beautiful. He was in an open casket and there were speeches and prayers. Lots of mention of unifiji, given that most of his adult life he worked here. One of his friends from here gave a speech. Then his cousins performed a ritual, where they were blessed, and then poured herbal water into his mouth, passed incense around his body, put garlands over his head, put the turmeric mark on his forehead and said their goodbyes. That was when the women started wailing. After that, they took him in a van up to the cemetery and the men kept him company while they put his body in a fire" (by Professor Ruth Irwin, Education Professor, School of Humanities and Arts, University of Fiji, Saweni campus, used with permission).